What is Critical Point Drying? Critical Point Drying is so named as it includes, as part of its process, the occurrence known as the continuity of state for which there is no apparent difference between the liquid and gas state of a medium, the surface tension between this interface reducing to zero. This occurs at a specific temperature and pressure with resulting density, and is known as the Critical Point. 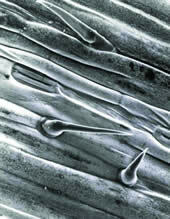 This condition of zero surface tension can be used to dry Biological Specimens, avoiding the damaging effects of surface tension. In biological specimens we are mainly concerned with the removal of water. Unfortunately, the critical point for water of +374°C and 3212 p.s.i. is inconvenient, and would cause heat damage to the specimen. The most common and convenient transitional medium for critical point drying is Carbon Dioxide (CO2), which has a critical point at 31°C and 1072 p.s.i. However, it is not miscible with water, and therefore, we have to involve a third medium, commonly Acetone, which is termed the intermediate fluid. We can now convert our transitional fluid, typically CO2, from liquid to gas without surface tension at the critical point. Critical point drying is an established method of dehydrating biological tissue prior to examination in the Scanning Electron Microscope. 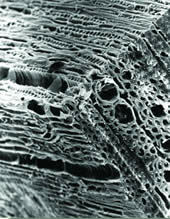 The technique was first introduced commercially for SEM specimen preparation by Polaron Ltd in 1971. The original design concepts, which included a horizontal chamber, are still embodied in the design of the EMS 3100 CPD model. In recent years we have introduced two further models: the EMS 850, which features built-in chamber cooling and heating, and the EMS 850WM, which is designed for drying a 100mm/4" silicon wafer. All three models have found general acceptance in many laboratories throughout the world. Together, these critical point dryers offer the user a choice most suited to the particular specimen preparation requirements. 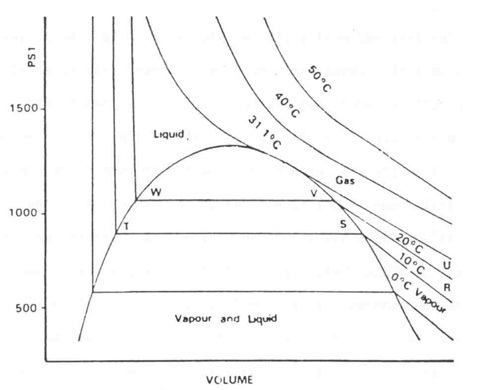 The phase diagram shows the pressure to temperature ranges where solid, liquid and vapor exist. The boundaries between the phases meet at a point on the graph called the triple point. Along the boundary between the liquid and vapor phases it is possible to choose a particular temperature and corresponding pressure, where liquid and vapor can co-exist and hence have the same density. This is the critical temperature and pressure. Critical point drying relies on this physical principle. The water in biological tissue is replaced with a suitable inert fluid whose critical temperature for a realizable pressure is just above ambient. The choice of fluids is severely limited and CO2 is universally used today, despite early work with Freon 13 and nitrous oxide. With CO2 a critical point of approximately 35°C can be achieved at a pressure of around 1,200psi. Therefore if the water is replaced with liquid CO2 and the temperature then raised to above the critical temperature, the liquid CO2 changes to vapour without change of density and therefore without surface tension effects which distort morphology and ultra structure. Since liquid CO2 is not sufficiently miscible with water, it is necessary to use an intermediate fluid which is miscible with both water and liquid CO2. In practice intermediate fluids commonly used are methanol, ethanol, amyl acetate and acetone. 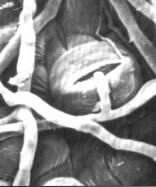 The advent of Scanning Electron Microscopy (SEM) in the study of surface morphology in biological applications made it imperative that the surface detail of a specimen was preserved. Air (evaporative) drying of specimens can cause severe deformation and collapse of structure - the primary cause of such damage being the effects of surface tension. The specimen is subject to considerable forces, which are present at the phase boundary as the liquid evaporates. The most common specimen medium, water, has a high surface tension to air; by comparison that for acetone is considerably lower. The surface tension could be reduced by substitution of a liquid with a lower surface tension with thereby reduced damage during air-drying. However, the occurrence of what is known as 'continuity of state' suggests a drying technique for which the surface tension can be reduced to zero. If the temperature of liquefied gas is increased the meniscus becomes flatter indicating a reduction in the surface tension. If the surface tension becomes very small the liquid surface becomes very unsteady and ultimately disappears. When this 'critical point' is reached, it is possible to pass from liquid to gas without any abrupt change in state. If a specimen had been in the liquid during this process it would have experienced a transition from a ‘wet’ to a 'dry' gas environment without being in contact with a surface, in this way avoiding the damaging effects of surface tension. This is termed Critical Point Drying (CPD), the basis of which are the classic experiments carried out over 100 years ago during investigations on the liquification of gases. Fruit body neck with spores adhering to the sides Bacteria adhering to the tip of a fungus. Powdery Mildew, hyphal filament on leaf surface. The principle of the experiments, which were initially carried out using carbon dioxide (CO2), was to measure the change in volume with the application of pressure, of a fixed mass of gas, while maintaining a constant temperature. This was repeated for a range of different temperatures. The results are best understood by considering the graph obtained from plotting pressure (P) against volume (V) for the series. This is shown in Figure 1; the curves obtained are termed ‘isothermals’. Consider first the 10°C isothermal at low applied pressure. The CO2 is gaseous (vapor) and generally exhibits the characteristics of a gas (Boyle’s Law) over the range from 'r' to 's'. From point 's' a very slight increase in pressure results in a change from vapor state to the liquid state. This is the phenomena of saturation. From 's' to 't' the pressure is virtually constant while the volume is decreasing and at 't' the substance is all liquid. From point 't' the graph becomes almost vertical indicating significant application of pressures for very little change in volume, liquids being virtually incompressible. The 20°C isothermal has similar general characteristics, however there is less difference between points 'v' to 'w' compared to the difference between equivalent points 's' to 't' on the 10°C isothermal; these points representing the difference in volume occupied between the vapor phase and the liquid phase. This indicates that the densities of the saturated vapor and liquid are approaching each other, also the slight departure from the vertical 'w' shows the compressibility is greater than that at higher pressures. This shows that the properties of the liquid and gas states of the substance are becoming similar and will ultimately coincide. This in fact is realized at the 31.1°C isothermal, which does not show any horizontal discontinuity. The temperature at which this occurs is termed the Critical Temperature and has an associated Critical Pressure and Density and hence for a particular mass of gas, a Critical Volume. If a liquid was heated in a closed system so that the critical pressure could be attained, at the critical temperature, any visible meniscus would disappear; the surface tension would be zero and it would not be possible to distinguish between the properties of a liquid or a gas. We therefore have continuity of state. Above this temperature the gas cannot be liquified by the addition of pressure and strictly speaking a substance should only be classified as a gas above its critical temperature, below this temperature where it could possibly be liquified by the application of pressure, it is more precisely termed a vapor. 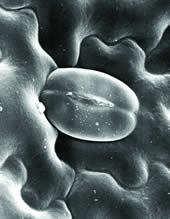 The critical phenomena can be utilized as a drying technique as it achieves a phase change from liquid to dry gas without the effects of surface tension and is therefore suitable for delicate biological specimens. However, it is not surprising that the initial investigations were on CO2 as will be apparent from Figure 2, showing a table of critical constants for some common substances. Even the practical achievement of the critical conditions would not assist the biologist, as the specimens would suffer significant thermal damage if we attempted to apply the technique direct for the removal of water from specimens. Therefore CO2 remains the most common medium for the CPD procedure and is termed the 'Transitional Fluid'. However, CO2 is not miscible with water and therefore water has to be replaced in the specimen with another fluid which is miscible with CO2, this is termed the 'Intermediate Fluid'. Ideally it will be able to replace the water in the specimen, and also serve as the 'Dehydration Fluid'. This is not exclusively the case, and additional steps may be used for particular circumstances. However, where it is being utilized for both processes, texts may refer to it under the different headings, dehydration and intermediate, depending at what stage it is being used in the specimen preparation schedule. Prior to any of these stages chemical fixation of the specimen must be carried out (normally using glutaraldehyde -osmium procedures). The whole discipline of specimen preparation (chemical or vapour fixation) prior to the transitional stage is only mentioned in its most basic terms, procedures vary according to the type and nature of the specimens. Further references should be obtained. As mentioned previously this involves dehydration and intermediate fluids, the following is a possible schedule. The specimen is usually processed through varying concentrations of dehydration fluid, culminating in complete replacement of the water with this intermediate fluid. Because it has a low surface tension the specimen is less likely to experience damage due to evaporation while transferring to the chamber, also being miscible with CO2 (the Transitional Fluid) ensures satisfactory conditions after flushing (purging) for the CPD process to commence. Having transferred the specimen to the chamber in the Intermediate Fluid, the chamber is flushed several times to replace it with the Transitional Fluid. The process from which the complete techniques derives its name CPD can now be initiated. As discussed previously (see Figure 1) the conditions for which the critical point passage can be obtained for CO2 are 31.1°C and 1072 psi. However, it must be remembered that these isothermals are obtained from a fixed mass of gas and an applied pressure for a series of constant temperatures. In the laboratory application of CPD we have a fixed volume which is filled with the transitional fluid. Some typical examples of which are given in Figure 4. Pressure is obtained by the effect of applying heat and while it can be readily appreciated that we can take a liquid from below its critical temperature and obtain the transition to gas above its critical temperature, an understanding of the relevant 'start' and 'end' points and the cycle involved is required in evaluating the design and performance of CPD equipment. It is still useful however, to utilize these CO2 isothermals as indicated in Figure 5 with the superimposed ‘arrows' showing differing conditions for the CPD device. If we consider 'X' with the liquid CO2 more than half filling the total available volume and we heat from 10°C to 35°C then we will make the transition from liquid to gas. The pressure rise will be rapid as the liquid will expand and the level will increase before the critical temperature is reached. This is termed 'going around' the critical point. Usually (as in the case of instruments supplied by Quorum Technologies) a pressure-bursting disc is employed to prevent excessive pressure increase. For condition 'Y' with approximately a full pressure chamber, the liquid level will remain relatively constant, its density decreasing and that of the vapor increasing, and becoming the same when its critical temperature has been reached, together with the corresponding critical pressure. Looking at condition 'Z' with the pressure chamber less than half full. The level will fall and vaporization will occur before the critical temperature is reached, also the specimens may be uncovered and subjected to unwanted evaporation. Ideally, we wish to have a situation where the liquid fills the specimen chamber, while still only accounting for approximately 50% of the total volume available. This will ensure that specimens are not uncovered during initial flushing stages and in addition this should enable critical constants of temperature, pressure, and density to be achieved relatively simultaneously without excessive pressure or evaporation conditions occurring. It is also advisable to maintain a temperature somewhat above the critical temperature during decompression, this will avoid the possibility of gas recondensing. It is also important to control the decompression rate itself as there is evidence that rapid pressure equalization can cause specimen. EMS 91090 Critical Point Dryer, 91090-WM Large Chamber Critical Point Dryer, EMS 3100 Critical Point Dryer are available online from the EMS Catalog. For ordering or product information, click here.